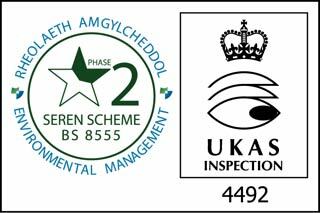 Brooke Estate Management Ltd are proud to be independently accredited to BS8555: Environmental Management. This being the UK British Standard for best practice. Brooke Estate Management Ltd are Licensed Waste Carriers with Natural Resources Wales and the Environment Agency (England). We will remove all materials from the work we carry out from your premises unless otherwise instructed by you. We aim to recycle all the materials that arise from our Tree works and Grounds maintenance work. These are available for use in gardens as a mulch or as animal bedding. Logs and fire wood are available for fuel use. Please click on the wood products link on the left of the screen for more information.